Is teleportation possible? Read what the Bible says about it and be encouraged! You don't have to wait for scientists to invent teleporting machines because God has promised it in His word - with God nothing is impossible. If you like this original Bible study, you can also check out my Patreon for more exclusive Bible studies, sermon notes, devotionals and eBooks that are not posted anywhere else. Teleportation is a fantasy for many fans of science fiction. You walk into a portal or machine, and BANG, a moment later you’re at another location. The Oxford Dictionary defines “teleport” this way: to transport or be transported across space and distance instantly. Is teleportation just a figment of imagination, or is it possible? Or rather, has it already happened before? Actually it has, and it was recorded a few times in the New Testament of the Bible. In the Book of Acts, Philip, a believer and disciple was teleported from the desert to Azotus. Philip was in the desert and a moment later he found himself at Azotus - if that’s not teleportation then I don’t know what is! Another incident was recounted by the Apostle Paul of someone that he knew who experienced supernatural teleportation. However it is not clear whether he was teleported in his physical body or it was happening as a vision in his mind’s eye. ​Teleportation is possible with the God of time and space - With Him nothing is impossible. Nevertheless, our God is truly a God who defies all impossibilities. Science is playing catch up with God. There are still many things that science can’t understand or explain, but are already recorded for us in the Bible, such as these incidents. The next time you face a seemingly impossible situation that looks like there’s no way out of your trouble, remember that God can even teleport a man from one location to another, what else can He not do for you? All things are possible for those who believe in God - even teleportation. Since God can teleport a person, it also shows that His power is not limited to time or space. Worried about your future? He is already there preparing the way for you and removing obstacles planted by the devil. Afraid of growing old and dying? He can renew your youth like the eagles and extend your years on this earth. Need a breakthrough urgently? He can compress the time that’s usually needed and help you accomplish more in less time. Feeling concerned about your family members who are living overseas or perhaps traveling somewhere dangerous? God is right there protecting them even when you are oceans apart. All you have to do is allow our God of time and space to work in your life - He will gladly demonstrate His love for you. If He has given you Jesus His only Son, He will surely give you all other blessings as well. Talking about Jesus, another instance of teleportation was facilitated by Jesus Himself. It’s got to do with wind, waves and a boat. There’s a very powerful revelation in that incident and you can read about it in my exclusive devotional on Patreon. Pinterest Pinnable Image. Pin this to let your friends know that the Bible says that teleportation is possible and that is has happened before and will happen again when Jesus comes back for us in the Rapture! Did you know that there will be a future instance of mass teleportation that will take place at an unknown time and it will occur worldwide? This future global phenomenon of widespread teleportation is so significant that the Holy Spirit deemed it necessary for Jesus’ words about this to be recorded in two of the four gospels! During the Rapture, the physical bodies of believers who are still alive on earth will be changed instantaneously to become new spiritual bodies. They will then be caught up immediately to meet the Lord Jesus in the air. You don’t have to wait or hope for scientists to invent machines that can teleport people from one place to another. If you are a believer in Jesus, you have a one-way ticket to experience teleportation in the future to the best place possible: to Jesus’ presence where you will enjoy bliss for eternity. Is teleportation possible? God has already recorded and promised it in His word. Now it’s up to you to choose whether to believe what the Bible says! What is your opinion about teleportation? Do you believe that scientists will come up with inventions to make this possible in the natural? Share your thoughts in the comments below! Is teleportation possible? We can examine the Rapture as described in the Bible for a future case of mass teleportation. Believers will all be instataneously caught up to be with the Lord Jesus forever! 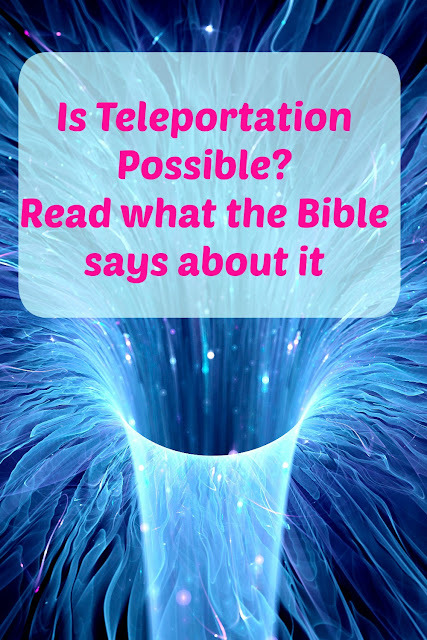 I hope that you have been blessed by reading this post on "Is Teleportation Possible and What Does the Bible Say About it? With God Nothing is Impossible". Please Like, Share and Comment on this post if you were blessed by it! ​Patron Credits: Thank you Terence Koh for supporting our blog as a "Superabundant Grace" tier patron. We appreciate your blessings! Scientifically, teleportation is impossible as of now. In God, everything is possible. The Bible does not directly address the idea of time travel, at least not the type of time travel commonly featured in science fiction.